Farm Horses. 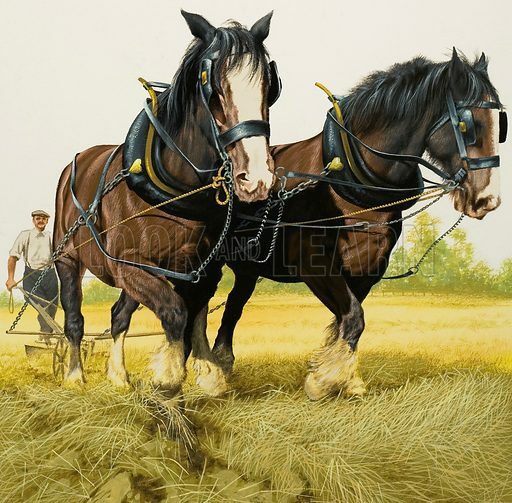 Before the Middle Ages, oxen were used for farm work, but the invention of the horse collar and the large supply of heavy, powerful horses which became available when knights ceased wearing heavy armour, meant that oxen were replaced by big, powerful horses. Original artwork for illustration on p8 of Look and Learn issue no 1049 (17 April 1982). Lent for scanning by The Gallery of Illustration. Available worldwide for immediate download up to 4,037 x 3,964 pixels.